Mower Magic has provided Lawn and Garden Power Equipment, Sales, Service and Hire to Home Owners, Lawn Mowing Contractors and Garden Care Professionals for over 30 years. They stock and supply a comprehensive range of Top Brand Garden Power Products and provides full after sales service, repair facilities and spare parts supply for all brands of equipment. 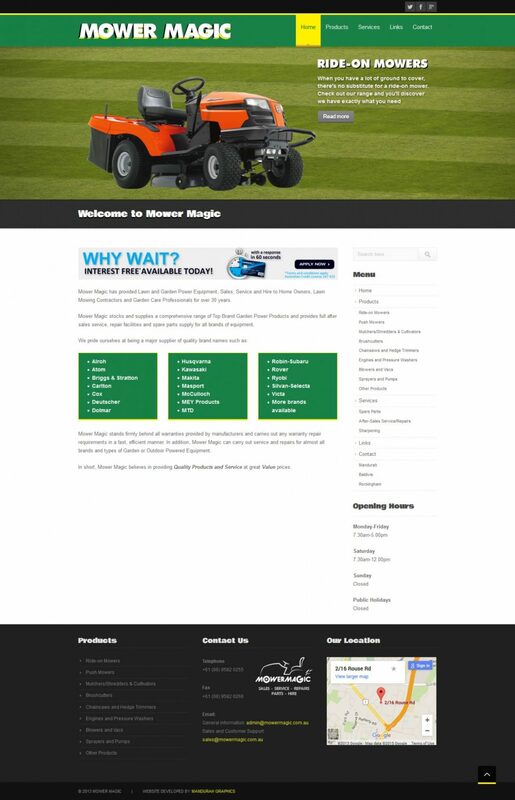 Mower Magic was a fully redesigned and redeveloped website project undertaken by Mandurah Graphics. Using the content from the old site, we put together a new contemporary and professional layout, populating it with products stocked by Mower Magic. As the site was constructed in the WordPress content management system, we were able to quickly and easily add and remove products as required, and were able to train the client to do the same, keeping the site always up-to-date and relevant.